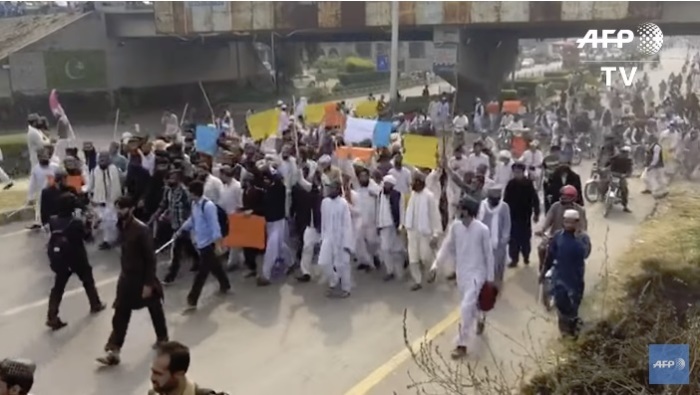 The Christian persecution watchdog group International Christian Concern reported the events that took place last week in the Farooq-e-Azam neighborhood of Pakistan’s fifth-most populated city of Karachi. The organization reports that a Muslim woman named Samina Riaz accused four Christian women who ranged in age from 14 to 30 of desecrating the Quran last Tuesday, according to an eyewitness. Last Tuesday, Riaz accused three of Dildar’s daughters and another Christian woman of damaging a copy of the Quran, Islam’s holy book. Those accused of blasphemy are 22-year-old Sunaina Amjad, 18-year-old Sophia Amjad, 14-year-old Soneha Amjad, and 30-year-old Sophia Qamar. “She claimed they stole a copy of the Quran and ruined it by submerging it into a basin of dirty water,” local witness Aslam Masih told ICC. News of the accusation spread quickly, which reportedly inspired a mob of enraged Muslim locals to gather in the neighborhood. According to the witness, the mob attacked several Christian properties in the area and a local church. Dildar’s home was among those that were damaged by stones. The armed group also killed pets and livestock. In all, about 200 Christian families fled the neighborhood in search of safety in other areas of the city. Masih told ICC that after a police investigation, it was learned that Riaz had borrowed the copy of the Quran from a nearby shopkeeper and herself submerged the book underwater in the restroom of her home. Riaz and her husband were later arrested. Riaz allegedly admitted that she orchestrated the whole thing. “ICC’s thoughts and prayers go out to the four Christian women who were falsely accused and the Christian community of Farooq-e-Azam,” ICC regional manager William Stark said in a statement. The accusation made by Riaz highlights how Pakistan’s widely criticized blasphemy laws are often abused by majority Muslims as a way to settle personal scores with religious minorities. Human rights activists have long called for the blasphemy laws to be abolished. In fact, the U.S. State Department released a statement last summer condemning blasphemy laws in countries like Pakistan. Those convicted under Pakistan’s blasphemy laws can be subject to the death penalty or life in prison. Although no person accused of blasphemy has yet been executed by Pakistan’s judicial system, Christians in the past have been brutally killed as a result of societal violence stirred by blasphemy accusations against them. Asia Bibi, a Christian mother of five, was accused of blasphemy in 2009 after an argument with Muslims farm laborers she work with. She was convicted and spent years on death row before she was finally acquitted last year by the nation’s Supreme Court. Her acquittal was upheld earlier this month. The Catholic human rights group Aid to the Church in Need warned earlier this month that despite Bibi's acquittal, there are many other Christians who've been falsely accused of blasphemy. One is a young Christian man named Sawan Masih who was sentenced to death for blasphemy in 2014. After five years, Masih is still awaiting appeal proceedings. ICC reports that over the past 30 years, 1,500 individuals have been accused of committing blasphemy in Pakistan. ICC notes that religious minorities comprise the majority of those accused of violating the blasphemy laws even thought about 97 percent of Pakistan is Muslim. Pakistan ranks as the fifth worst country in the world when it comes to Christian persecution, according to Open Doors USA’s 2019 World Watch List.